Grimorium Verum (or ‘grimoire of truth’) are a Russian duo named after the ‘legendary’ book of ceremonial magic. They were limitedly active at the end of last century, and they took a five-year break. But in 2006 this Syktyvkar-based act returned, with Retaliation (2008) and Reborn (2011) as result. And now there’s Relict, album number three, once again created by Andrey Zavalnyy (guitars, bass, keyboards, music, orchestrations) and Roman ‘Diamond’ Dokuchaev (vocals, music, lyrics), with assistance of several session musicians. 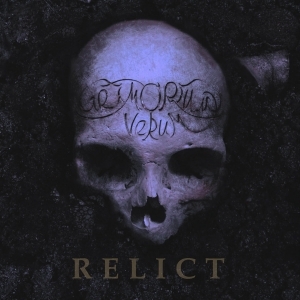 Relict has a total running time of forty eight minutes and opens with the instrumental title track, an energetic and bombastic, horrific and mysterious intro with many keyboard layers, ritual drum patterns and choir-like voices. Then comes Rising Morning Star, and based on the introduction I just mentioned, the ‘style’ of the ‘real’ songs is pretty predictable. Indeed, Grimorium Verum’s Black Metal is of the fast and furious kind, totally rooted within the Symphonic BM-tradition. This material is very closely related to the likes of, well, somewhat everything that might stand in between Dimmu Borgir (main influence), Immortal Remains, Cradle Of Filth, Troll and Covenant (before the latter became The Kovenant), Limbonic Art, Shade Empire, Old Man’s Child and Penetralia (quite some Norwegian sonic violence, I know…). For sure there is a maleficent lack of originality; what’s more: this material comes with all ingredients that are needed: an ultimately heavy rhythm section, majestic synth passages, piano-alike intermezzi, evil-growling screams and some deep grunts, fast outbursts with fiery leads, and so on; even the additional female voices and clean male vocals, the breaks and tempo-changes, and the neo-classical / operatic / symphonic orchestrations are present (as intro or intermezzo). And believe it or not (but why shouldn’t you): the sound quality itself lies totally within the very same dimensions, being clean and decent, maybe little grotesque, yet resulting in quite an effective equilibrium, mix-wise, when focusing on the different instrumental aspects.